Indeeco screw plug immersion heaters are ideal for use in direct heating of liquids and gases in a variety of processes for hazardous and non-hazardous locations. Indeeco offers customized wattages with voltages up to 600V and are available in 1", 1-1/4", 2", 2-1/2", and 3" NPT sizes. You can order from stock or customize for your specific application. Screw plug immersion heaters are ideal for use in direct heating of liquids and gases in a variety of processes. Indeeco offers customized wattages with voltages up to 600V and are available in 1", 1-1/4", 2", 2-1/2", and 3" NPT sizes. You can order from stock or customize for your specific application. Indeeco explosion-proof screw plug immersion heaters are CSA approved, for use in hazardous areas classified as Class I, Division 1, Groups B, C and D; and Class II, Division 1, Groups E, F and G.
For optimum performance and to maximize service life there are key factors that need to be considered before selecting an immersion heater. 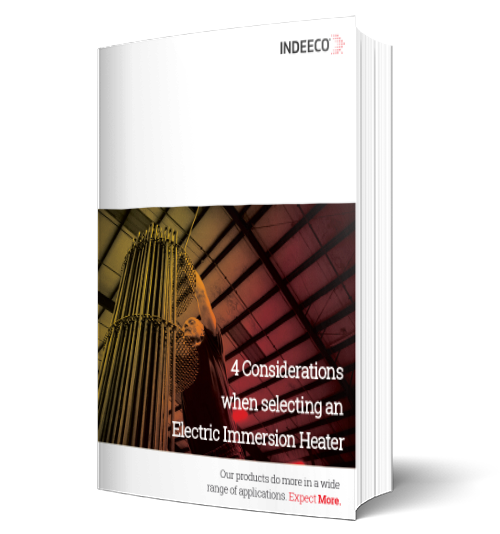 In this download, we look at a few of the decisions one must make when selecting an electric immersion heater.